Char-broil compact grill features a 300 square-inch primary cooking surface that is heated by two separate 24,000 BTU burners. A secondary swing-away warming rack, which measures 140 square-inches, provides additional cooking space. Individual control-dials mean that you only have to use burner at a time, while the built-in Piezo ignition button makes firing up the grill a snap. The unit is powered by a refillable propane tank that is connected with rubber hoses. Two side shelves provide extra food preparation surfaces, and the porcelain-coated steel lid and firebox provides an easy-to-clean solution suitable for small families or gatherings. Constructed from black, powder-coated steel, this attractive, compact grill seems to have been designed for people with limited space for outdoor cooking and entertaining, and who desire quality and affordability. 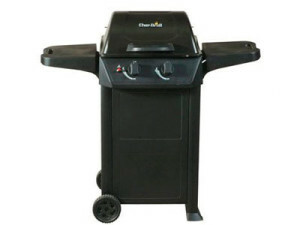 Char-broil’s 24,000 BTU grill comes accompanied by easy to follow, clear instructions, and customer service numbers. All the parts are either easy to recognize, or clearly labelled, which serves to makes the instructions even easier to follow. The disassembled unit takes less than an hour to build from opening the box, to wheeling into position. Customers have reported that all the parts required are consistently contained inside the box. Upon completed construction, the unit seems sturdy, without any shakiness. The compact designed unit is small enough to fit almost anywhere you want to put it. The attached six-inch wheels and lightweight design make moving this unit around effortless. The porcelain-coated steel lid is easy to wipe clean with simple paper towels. Some consumers, however, have reported that the front panel corrodes very quickly, and the lid is a little bit flimsy. Furthermore, they have said that the unit, on the whole, is quick to rust, including the grill-racks. The primary stainless-steel grill provide enough space to easily cook a dozen or so wings, a dozen sausages or hot dogs, or a about six good-sized burgers, which is enough to feed an average-sized family. A secondary swing-away warming rack can be used to keep some items warm while you prepare other food items, which is perfect for a larger gathering. The grill-spokes are set a little bit wide though, and customers have experienced food slipping through into the firebox. Char-broil’s 24,000 BTU grill is very efficient on propane, reducing its overall cost of ownership. The sturdy temperature-control dials are very responsive, and help further reduce propane consumption. Customers have reported using this grill daily, and their propane tank lasting well in excess of three weeks. The Piezo ignition button works readily; however, some owners have stated that it needs two or more pushes to work after only a few weeks of ownership. No regulator problems have been reported. Overall, Char-broil’s 24,000 BTU grill seems to be excellent value for money. The benefits reported by customers far outweigh the cons. Most adverse issues seem to be related to rust, which affects all metal outdoor equipment at some time or another. With grills, these issues can be tackled easily by making sure that the unit is kept dry during damp or wet weather, and following the manufacturer’s recommended maintenance schedule that is included in the instruction book.